HomeMolybdenum AlloyHow does the Molybdenum Work in Coating Industry? Like tungsten, molybdenum is a kind of refractory metals, and its melting point is 2620 ℃. Molybdenum has strong interatomic binding force, low expansion coefficient, high conductivity and good thermal conductivity. With the rapid development of electronic information industry, the application of molybdenum as the sputtering target has been increasing. The sputtering target material is the foundation of obtaining thin film material. With the rapid development of thin film science and the continuous progress of thin film technology, the research on target material has also been greatly developed. The application fields of the sputtering target include the plane display, semiconductor, magnetic recording storage, optical recording storage, solar energy machinery, automobile, glass, decoration and other industries. Among a wide range of target materials, molybdenum target has many excellent characteristics, so it is widely used in the plane display industry, thin film solar cell industry, semiconductor industry, medical industry, mechanical processing industry, solid lubrication and other aspects. 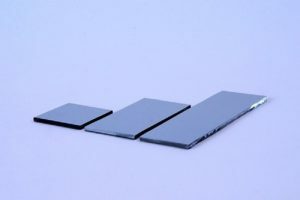 In recent years, molybdenum alloy targets, as electrodes and wiring materials of flat displays such as LCO(liquid crystal display) and PDP(plasma display), has attracted more and more attention. In TFT-LCO, the gate electrode is a key component, which was mainly used as gate material by Cr/AL. With the large size and high precision of planar display, the specific impedance of materials is more and more demanding. The specific impedance and membrane stress of molybdenum are only 1/2 of that of chromium, and the hexavalent Cr can be produced during the etching process, which is harmful to environment and health. Therefore, more and more companies use Mo/AL as the grid electrode material, so the demand for molybdenum target is increased. In order to further improve the corrosion resistance (discoloration) and tightness (stripping of the film) of pure molybdenum, the addition of V, Nb, W and Ta in molybdenum will make the performance of specific resistance, stress and corrosion resistance better. In the field of solar cells, the unification of low cost and high efficiency has always been the goal of solar energy development. After five years of high-cost silicon-based solar cells, low-cost thin-film solar cells will be a major player in the solar market. The back electrode material is required in the film layer of thin-film solar cells, while molybdenum target has the advantages of glass corrosion resistance, high-temperature resistance, and good conductivity, so it becomes the first choice of back electrode material. Besides that, molybdenum target can be used with other target materials co-sputtering or other process conditions, and it is widely used in the fields of semiconductor wiring, medical treatment, mechanical processing and solid lubrication. Another important application of molybdenum in the coating industry is spray coating. Molybdenum coating is widely used to improve the wear resistance of piston ring, bearing, extrusion equipment, engine cylinder, turbine parts, etc.